We appreciate the kind feedback from those we work with! 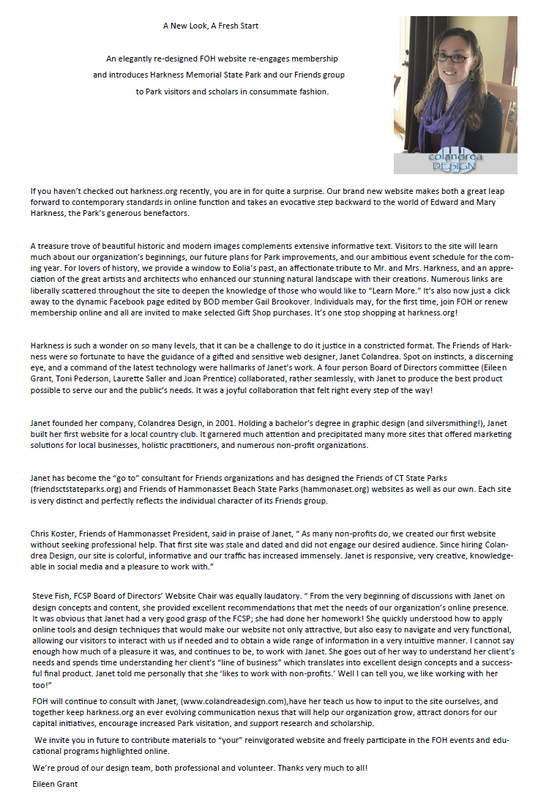 The Friends of Harkness were so fortunate to have the guidance of a gifted and sensitive web designer, Janet Colandrea. Spot on instincts, a discerning eye, and a command of the latest technology were hallmarks of Janet’s work. A four person Board of Directors committee (Eileen Grant, Toni Pederson, Laurette Saller and Joan Prentice) collaborated, rather seamlessly, with Janet to produce the best product possible to serve our and the public’s needs. It was a joyful collaboration that felt right every step of the way!